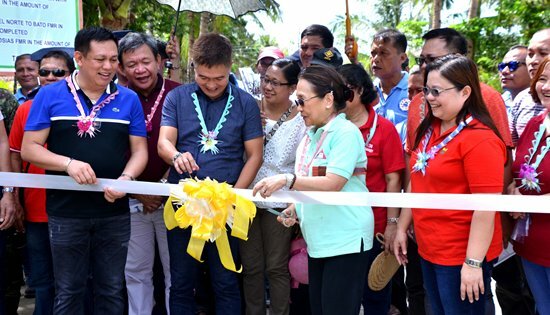 DAR Undersecretary Sylvia Mallari (2nd from R) and Northern Samar Vice Governor Gary Lavin (2nd from L) cut the ceremonial ribbon during the inauguration of the three road projects in Gamay implemented under the second phase of the Agrarian Reform Communities Project (ARCP-II). Assisting them are mayor Timoteo Capoquian (L) and Regional Director Sheila Enciso (R). GAMAY, Northern Samar – As highlight of the 71st founding anniversary celebration of this town Undersecretary for Foreign Assisted and Special Projects Sylvia Mallari of the Department of Agrarian Reform (DAR) turned over three farm-to-market road projects, one constructed with a 30-linear meter bridge, over the weekend. All projects implemented under the second phase of the Agrarian Reform Communities Project (ARCP-II) are contiguous passing through the barangays of Cagamutan, Bato, Bangon and GM Osias with an aggregate length of 8.3 kilometers. Mallari, who was the guest speaker during this year’s celebration emphasized the need to establish rural growth centers to combat poverty in the countryside. According to her, these are development projects such as rural infrastructures that would open opportunities particularly to the farmers and help solve insurgency in some areas as well. This is what DAR is doing in partnership with the local government units (LGUs), Mallari said. She added that this compliments the core mandate of DAR, the Land Tenure Improvement. Mallari explained that the establishment of rural growth centers is in accordance with one of the objectives under the Philippine Development Plan that is to achieve a better life and a brighter future by year 2040. Mayor Timoteo Capoquian acknowledged DAR’s contribution to his town’s development. According to him, DAR is the town’s biggest donor in terms of rural infrastructures referring to these turned over projects with a combined amount reaching P66.4-M. Though the total project cost was shared by the local government unit (LGU) and the national government thru a loan from the Asian Development Bank (ADB), Capoquian thanked DAR for assisting them build road networks. Meanwhile, Regional Director Sheila Enciso reminded the LGU and the recipient barangays to maintain the projects in good condition within a period of 10 years, otherwise the grant portion will be converted into a loan. Aside from the four barangays where the projects are situated, Provincial Agrarian Reform Program Officer (PARPO) Nida Abelido disclosed that residents from seven more remote villages are likewise benefited. An estimate of nearly 9,000 residents from the 11 barangays pass this route on their way to the national highway, she added. According to one resident, with the construction of the bridge, it is easy for them now to transport their products for they don’t have to wade through the river anymore in crossing Barangay Bangon.